Animals Lost & Found. Why Pet ID matters. It only takes a second or two for a furry family member to go missing. During National Pet ID Week from April 15-21, the BC SPCA is highlighting the importance of ensuring all your pets have permanent identification, such as a microchip or tattoo. “Nobody plans to lose a pet, but sometimes all it takes is a loud noise or an unlatched gate for a pet to go missing – at the BC SPCA we see thousands of pets go missing every year,” BC SPCA officer of marketing and community development Ali Omelaniec says. Retired school teacher Ray Furlotte thought he’d never see his beloved cat, Lilly, again after she slipped out of the house one wintry day. After the BC SPCA Trail Regional Branch received a call about a cat in a tree one day, and after a kind-hearted Good Samaritan climbed up the tree to rescue the cat from an abandoned crow’s nest, she was promptly checked for a microchip during her examination at the shelter. Furlotte was so grateful, he made lunch for the entire staff as a gesture of thanks. 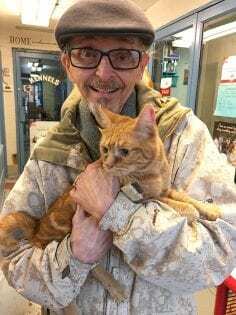 At the BC SPCA Shuswap Branch, someone brought in a stray cat one day. 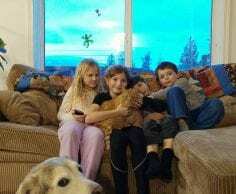 Once his microchip was scanned, staff contacted his humans – Vanessa Reed and family – to collect Finn, who had ben microchipped when his guardians had him neutered at the BC SPCA Kamloops Spay/Neuter Clinic. Because he had permanent ID – and because the contact information was kept up-to-date, Shuswap SPCA staff were able to contact the excited family within 10 minutes of Finn being brought in, notes branch manager Victoria Olynik. “A big ‘thank you’ to Vanessa for providing Finn with ID and a reminder to everyone to please, microchip or tattoo your pets so that they can be traced back to you. It’s also really important to keep your contact details up to date,” Olynik says. The BC Pet Registry, which now has more than 60,000 pets and their IDs registered, is a great way to help ensure your pet finds his way home no matter how far he wanders, notes Omelaniec. By registering your pet’s ID online, veterinarians and shelters are able to access their information, as animals are always scanned for a microchip or checked for a tattoo for staff to check in the database. Any microchip, licence, or tattoo can be registered in the BC Pet Registry, at $12 per year or $45 for the lifetime of your pet. Pet guardians can easily ensure their contact information is current by simply going online. “Why not have peace of mind if the unthinkable happens?” says Omelaniec. To register your pet’s permanent ID or to find out more about the BC Pet Registry, visit bcpetregistry.ca.